It’s Official! I AM SO EXCITED TO ANNOUNCE THIS! 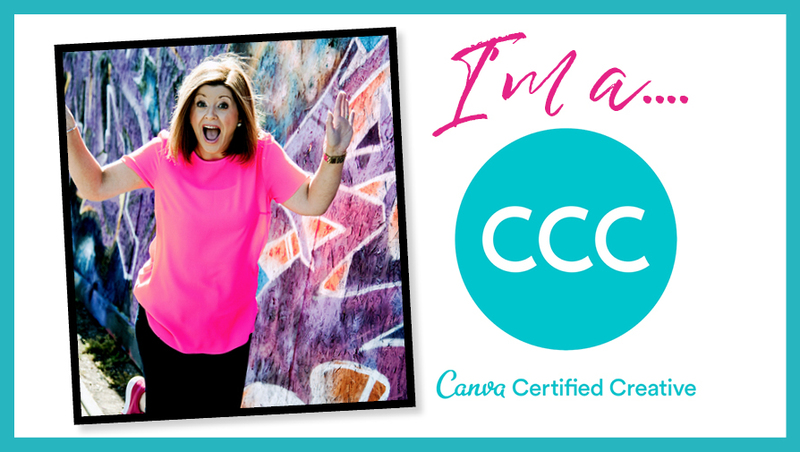 I am now a Canva Certified Creative! Look… I’ve got a logo an everything! I was approached by Canva last week and it’s now official – I am one of their ambassadors – when that email landed in my inbox a couple of weeks ago and I was asked – I jumped at the chance – how could I not – I love Canva! I’m a big advocate of sharing my design and branding knowledge, skills and advice to help you on your business journey – I have done this through my Canva courses and tutorials – I am all about the sharing and enabling you to create fast, beautiful designs with confidence. So what does that all mean for you? Well it means I get first dibbs on changes and new tech updates – so I can share them with you. We are all working as a team to streamline the transition from Canva 1.0 to Canva 2.0 – sorting any of the glitches out before that happens. I am part of fantastic community of Canva educators – any tech issues I’ll be able to answer. Direct access to Canva staff – yeah – they are so active in the community – it’s blown me away. All the latest scoop on the very latest Canva news. YAY! Access to some incredible tools and support to help me, help you, so that you can keep sharing and empower you to create great graphic designs, so you can create an impact with your customers. All of this to help YOU. What’s not to love about that? And the best part is – if you bought my Create in Canva with Confidence course you’ll be getting a FREE upgrade when Canva 2.0 officially kicks in. So here’s to the start of something new and special. THANK YOU to each and every one of you who has supported me and my business – and of course bought my Canva courses. Without you guys I wouldn’t be able to keep on doing what I love – so THANK YOU! If you want to find out what FREE Canva 2.0 Beta has to offer then come find out here.